Mumbai, Mar 21 (PTI) Rani Mukerji on her 40th birthday recalled her journey in Bollywood and the actor said it was not an easy one as she had to prove her worth every single day. The “Hichki” actor has penned a letter on the occasion and thanked all the filmmakers she worked with in the past 22 years for giving her roles that challenged the society norms. “It feels great to be 40! It feels great to have also worked for 22 years and having been incredibly lucky to get so much love and appreciation. Very rarely do we artists get material that can genuinely cause social change, cause change in attitude and thinking and I have been fortunate enough to get such content multiple times. I truly feel blessed. “I thank all the film-makers who have trusted me with their characters. 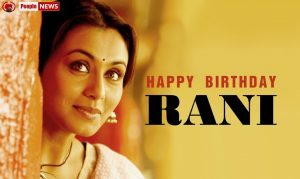 Your characters, your films, became my identity,” Rani said in the letter. Rani said she realised it very late that she was “born to be an actor” and that surviving in the film industry is tough as the actors, especially females, have to justify their existence every day. “I realised very late that I was actually born to be an actor, that I was born to entertain. And I hope I have been able to do just that. As a woman, I must admit, it has not been an easy journey. I had to prove myself everyday. Actresses have to prove themselves everyday,” Rani said. The actor also addressed the stereotypes and myths that prevail and are particularly targeted at female actors in the industry in her letter. “A woman has a short career span, a married woman’s equity dies, women are not bankable commodities at the box office, ‘female-centric’ (I hate this word!!) films are huge risks, a married actress who is also a mother is the final nail in the coffin of her dreams, ambitions and aspirations – these are some of the discriminatory stereotypes that we have to live with and try to overcome every single day,” she said. Rani said that contrary to males, female actors are judged everyday on the basis of their looks, dancing skills, voice and how they carry themselves in public. “For a woman, the disparity with a man is huge and glaring in this industry. We are judged for our looks, our dancing skills, our height, our voice, our acting, how we carry ourselves every time we step out of the house – we have to be the best and yet we are thought to be extremely dispensable. I have been asking my friends to talk about their weaknesses and how they overcame them,” she added. Rani said she wanted to break all such stereotypes in the industry and it was one of the reasons that propelled her to make a comeback to films after marriage and motherhood. “I have tried to take on this sexist stereotype by coming back to acting after my marriage and motherhood. And I promise you, I will continue working and battling these stereotypes with all my fellow stunning, beautiful, kind and talented actresses and hope to see our society and the film industry mature further,” Rani said.